The last thing you want at your wedding reception or corporate event is to constantly have to tell the band “it’s too loud…people are complaining…can you turn it down? ?” This is your event – not a rock concert! A truly professional wedding/corporate event band should never get complaints about their volume level or sound quality – yet so many do. Why?? Most bands only have speakers that point in ONE direction – forward. This works fine if they’re playing a rock concert or a nightclub – but NOT a wedding or corporate event. Because practically every wedding or corporate event has multiple tables with dozens, even HUNDREDS of guests that are to the sides of the stage – NOT in front of the speakers. If the band is playing a dinner set, the sound will be muffled for all the tables that are not in front of the speakers. To compensate, most bands are forced to simply “turn it up”. The result? A band that’s WAY TOO LOUD during your dinner and cocktail hour – maybe even the entire night! And to make matters worse, during toasts or award ceremonies, your guests who are seated in front of the speakers get BLASTED…while all the guests on the sides hear a muffled, indecipherable mess. Remember the teacher on Charlie Brown? That’s what your guests on the side will hear when the best man gives that funny, heartwarming speech that only the guests in front of the speakers will get to hear! Serenade of Souls overcomes this issue by using a “surround sound” PA speaker setup. 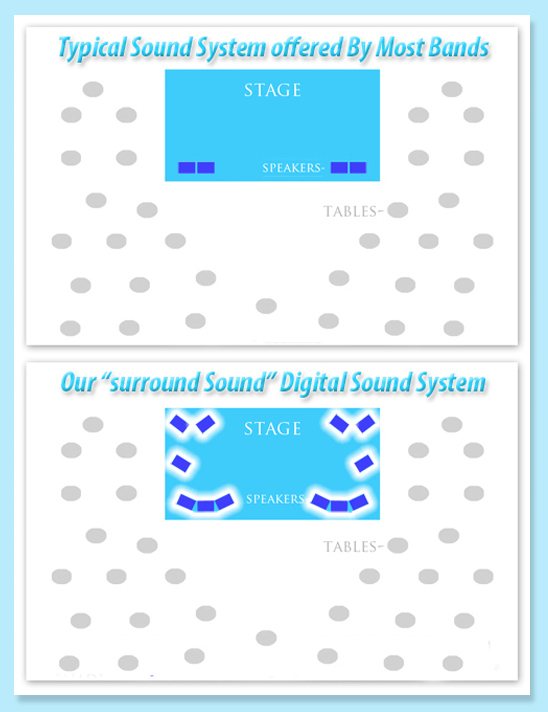 Which is essentially an extra 1,500 lbs and four times the speakers of most bands ALL of your guests, regardless of where they are seated, will have speakers pointed in their direction. The result? Everyone HEARS the music and speeches PERFECTLY – at a very comfortable volume level.